As Brexit negotiations near their end point, Theresa May’s government has been trying to find the balance between two seemingly irreconcilable goals. The UK aims to leave the single market and the customs union, without returning to a hard border on the island of Ireland. The text of the political agreement, known as the Joint Report, reached between the UK and the EU in December 2017 included a formula to “square the circle”. It stated that the aim of the future trade negotiations would be to address the challenge of the Irish border through the overall EU-UK relationship. If the future trade agreement finds it impossible to provide for a frictionless invisible border, then, “specific (technological) solutions” will apply to Northern Ireland. If the UK and the EU cannot agree on those “specific solutions”, then either the UK as a whole, or Northern Ireland, will remain aligned to the single market and the customs union after Brexit takes place. That third “backstop option” was legally codified in a protocol contained in the Draft Withdrawal Treaty in late February. It says that – should no specific solution be found – a common regulatory area comprising the European Union and Northern Ireland will be established and Northern Ireland will remain in the EU customs territory. May vehemently rejected the plan and said that “no UK prime minister could agree to it”. She also pledged to “explore workable solutions on the Ireland question”. As time went by, Dublin and other EU capitals underlined the need to see sufficient progress on this issue by the next European Council meeting of EU leaders on June 28 and 29. Although, the cabinet is still split over how to manage customs arrangements with the EU in the future, on June 7 the British government published its counter-proposal for a “backstop” arrangement to avoid a hard border on the island of Ireland. The biggest difference between the two “backstop” proposals is that the UK one applies to the whole country and not just to Northern Ireland. It proposes that the entire territory of the UK and the Channel Islands will remain part of the customs territory of the EU even after the end of the Brexit transition period in December 2020. Such an arrangement respects the promise of the UK government “to ensure that no regulatory barriers will develop between Northern Ireland” and the rest of the UK. It also eases the concerns of the Democratic Unionist Party (DUP) in Northern Ireland, on whose support the Conservatives rely for a majority in the House of Commons. The DUP leader, Arlene Foster, said in early June that she would withdraw her support to May’s government “if Northern Ireland was treated differently from the rest of the UK” after Brexit. Although Michel Barnier, the EU’s chief Brexit negotiator, initially welcomed the publication of the UK’s paper, in a press conference on June 8 he seriously doubted whether the backstop proposal could apply to the whole of the UK, rather than just to Northern Ireland. He argued that such solution raises questions of an à la carte access to the single market, services, goods or people that is unacceptable to the EU. The EU backstop option has been rightly criticised for reducing the single market “access of Northern Ireland to … goods, including agricultural and electricity”. 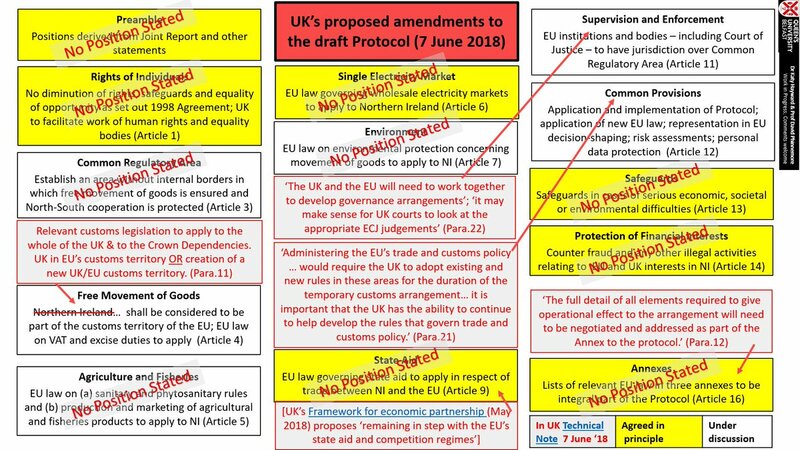 Regrettably, the UK proposal is even more limited as it explicitly only deals with customs processes and does not engage with issues such as regulatory alignment, agriculture, fisheries and environment that the EU “backstop option” covers. The UK government concedes, however, that to uphold its commitments with regard to the Irish border “an approach on regulatory standards … will also need to be addressed”. This is because, if there is no regulatory alignment between the two sides of the border, there must be, for example, regulatory checks on sanitary and phytosanitary rules of the various agricultural products that will be crossing to ensure the integrity of the single market. However, the paper contains no indication as to when to expect the UK proposals on regulatory alignment. One of the key questions raised by Barnier relates to whether the backstop has a time limit on it. Leading up to the publication of the UK document, there had been speculation that the UK Brexit negotiator, David Davis, was ready to quit unless the UK backstop proposal was truly time limited. The document published by the UK states that the backstop option “will be only in place until the future customs arrangement can be introduced” and that “the UK expects” this to happen by the end of December 2021. Notwithstanding the actual feasibility of this deadline, the ambiguity of that formulation raises two possible scenarios. If the UK insists on legally entrenching the deadline of the backstop option, the EU will reject such a suggestion not least because the Irish taoiseach, Leo Varadkar, has made clear that a Brexit backstop “cannot be time limited”. Alternatively, the EU may ask for a second backstop option without any time limitations specific to Northern Ireland. This will allow both the UK and the EU to comply with the political commitments undertaken in the December Joint Report. If the UK accepts that a backstop option is an insurance policy that cannot have a time limitation and the EU does not reject the possibility of a common customs territory with the UK even after the end of the transition, there will be negotiations about the exact obligations that the UK will have to undertake during the period of the backstop. Those may concern the UK contribution to the new EU budget and the supervision of the arrangement by the Court of Justice of the European Union. In any case, the Irish border might prove the pulling factor that keeps the UK in a close relationship with the EU for the next few years at least. For a region that became famous for its divisions, such a role is almost a historical irony. This article was first published in The Conversation on 8 June 2018.